Have you heard of jackfruit? If you're vegan and spend any time on Instagram, it’s likely you have. For the uninitiated, though, a quick run-down on the fruit: it's large. Really large. It can weigh up to 35kg (80lbs) and measure half a meter (20 inches) across. It's the national fruit of Bangladesh. I didn't know countries have national fruits, but there you go. I’ve checked and England doesn’t have a national fruit. I think it should be the strawberry. Yeah. Strawberry. All over the world jackfruit is on the up. The jackfruit tree is resistant to pests and drought and is very low maintenance. Plus, the fruit is rich in fibre, potassium, calcium and iron, which makes it a potentially useful addition to resolving the climate-change driven shortage of staple crops such as wheat and corn in the third world. What's further intriguing about jackfruit is its texture. The fruit is often harvested before it's ripe to stop it sweetening so that it can be used in savoury dishes. 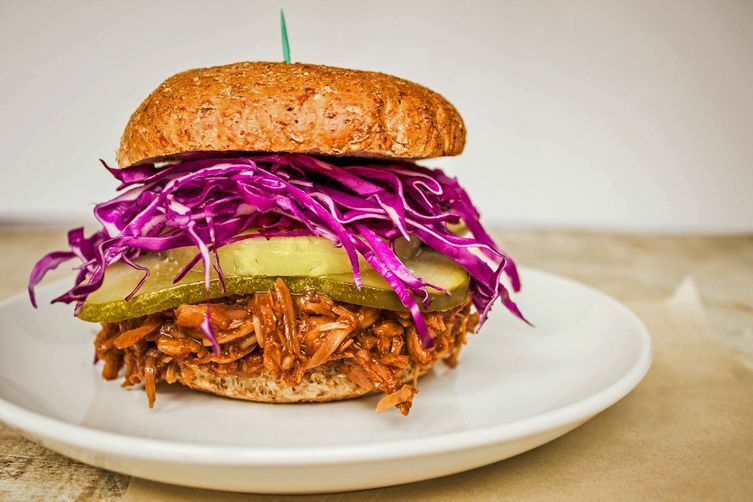 Known as ‘young’ or ‘green’, it has a fibrous, meaty texture that works a charm in curries, stews and frequently, in the western world, barbecue pulled 'pork' sliders. There are a zillion barbecue sauce jackfruit recipes out there, so instead I've developed a Caesar salad recipe which makes use of jackfruit’s chicken-like appearance and texture. I must add, the dressing is particularly good here. It's creamy but light, tangy from the lemon juice and apple cider vinegar, with a subtle kick from the dijon mustard and black pepper. Combined with the jackfruit, crisp romaine lettuce leaves and crunchy garlic croutons, this is a real summer treat. Especially washed down with a cold beer – strictly to pay homage to Caesar salad's history: it was originally assembled table-side for prohibition-hit holidaying US tourists looking for a boozy break in Tijuana, Mexico. Preheat the oven to 200°C/390°F. Pat the jackfruit dry with a paper towel. Heat the 2 tbsp olive oil over a medium heat in a medium frying pan. Saute for 20 minutes, stirring occasionally. Set aside to cool. While the jackfruit it cooking, heat the 3 tbsp olive oil for the croutons over a medium-high heat in a small frying pan. Fry the garlic for about 1½-2 minutes, stopping if it's browning too quickly. Spread the bread out on a baking tray. Pour the garlicky olive oil over the bread and mix well with your hands so all the bread is coated. Bake the bread cubes in the oven for 10-15 minutes, shaking halfway through, and keeping eye on them so they don't burn. Set aside. Put all the dressing ingredients in a blender and blitz well until smooth. To assemble the salad, put the lettuce, tomatoes and spring onions (scallions) in a very large serving bowl. Put the jackfruit on top, then pour over ¾ of the dressing. Put the rest of the dressing in a small ramekin in case anyone wants extra. Mix the salad well then add half of the croutons and gently mix them in - you don't want them to become too soggy. Finally top with the rest of the croutons and serve. N.B. there are affiliated links on this page. This means if you purchase through them a tiny commission (at no extra cost to you!) will go to supporting this website. Jackfruit Caesar Salad [vegan]. A tangy, creamy, dressing over the meaty texture of jackfruit and crunch of roasted garlicky croutons.